Choosing the right contractor is key to the success of your home improvement project. At Eckert Construction, we are committed to getting the job done right the first time. We serve Rochester Minnesota and surrounding area -- we specialize in residential construction, remodeling, garage, roofing, and deck projects of all sizes. From the moment we start the project, until the time we leave, you receive quality, worry-free products and services. With more than 18 years experience in the construction industry, we know a job well done makes for satisfied customers. That is why more than half of our business results from customer referrals. Please take the time to browse our website and learn how Eckert Construction can meet your project needs. Spring is coming you better book your construction project before it’s to late. The schedule is filling up fast!! Regardless of your budget or tastes, Eckert Construction can finish your basement to perfectly suit your lifestyle. Helping the community! Donating a fence to Longfellow elementary school for their garden. 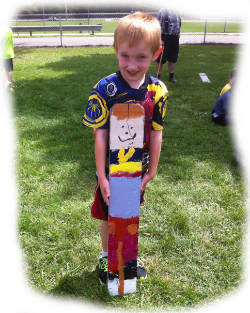 Each child got to paint a picket for the fence. Check it out at Longfellow elementary school!